Essex Junction, Vermont — (January 2014) — Lely Center Vermont will attend the 2014 Vermont Farm Show next week, in Essex Junction, VT. Visit booth #192-199 to learn more about the Lely Astronaut A4 robotic milking system as well as other Lely innovations, including automatic feeding systems and mobile barn cleaners. 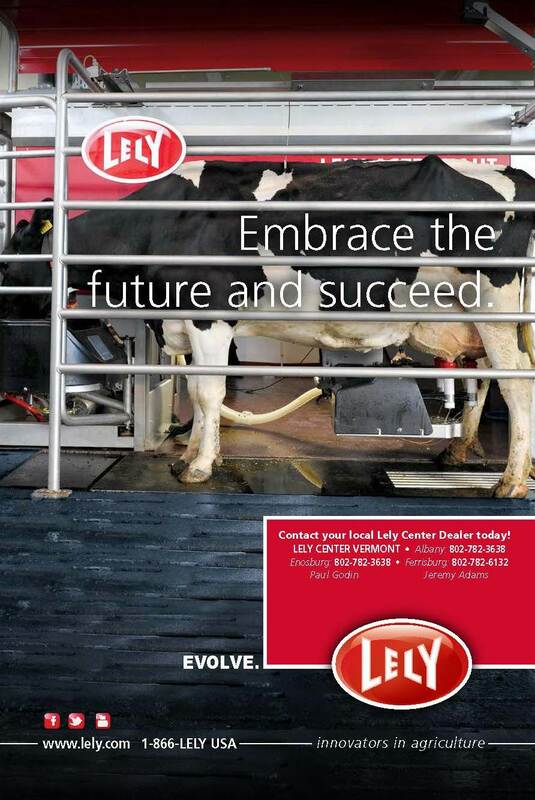 Lely Center Vermont is part of Lely’s exclusive Lely Center Distribution Channel in North America. The Lely Center is committed to sell and service the complete line of Lely’s dairy equipment products throughout the East Coast. They are market leaders and determined to improve the financial and social well-being of their customers. Since introducing the world’s first milking system more than 20 years ago, Lely has installed over 15,000 Astronaut robotic milking units worldwide and is the undisputed world leader in robotic milking technology. Tuesday, Jan. 28, 9 a.m. – 5 p.m.
Wednesday, Jan. 29, 9 a.m. – 7 p.m.
Thursday, Jan. 30, 9 a.m. – 4 p.m.
For more information, contact Paul Godin at 802-782-3638. Click here to visit the Vermont Farm Show website and download the official 2014 Guide.